I quickly caught on that, apart from the addition of Victoria Winters, this pilot episode is a remake of the film House of Dark Shadows and follows that more closely than the original show both are based upon. I rewatched that film again after watching this, and noted that a lot of the dialog is reused exactly or with only small revisions. Willie Loomis (Jim Fyfe) is now Mrs. Johnson’s nephew, which goes some way toward explaining why the Collinses keep him on. He’s a miserable and repulsive specimen, displaying all the signs of poor personal hygiene including teeth like Joseph Curwen. Willie spends his free time up in his room above the stables, chugging whisky from the bottle and studying old Collins family journals. He’s searching for a cache of jewels, hidden according to legend by “them old guys in the pictures” during the Revolutionary War for safekeeping. His plan is to steal an easily portable fortune without the Collinses even knowing about it, and split. He believes he’s just worked out an important clue about the old family crypt, when he’s interrupted by Roger, who berates him for neglecting to meet Vicky at the train. Willie does go to the Blue Whale sullenly, tries to get another drink out of Sam at the bar, and is spoiling for a fight with either Sam or Joe when the latter tries to intervene. In spite of this, Vicky agrees to let Willie drive her up to Collinwood instead of accepting Joe’s offer of a lift. This is meant to show how sweet she is and nice to Willie while everyone else scorns him–not silly enough to get into a car with someone who looks already well on his way to a DUI. Anyway, the two do get up to the house safely without swerving off the road or hitting anything. While Vicky is made welcome by the Collins family, Willie heads over to the crypt to work out the riddle in the old journal and triggers the door to the secret room. He doesn’t find the lost jewels as he’d hoped to, but he does discover a chained-up coffin and opens it… and meets his fate. When Daphne leaves the Blue Whale some time later, she is stalked through the empty streets of Collinsport and attacked just as she reaches her car. 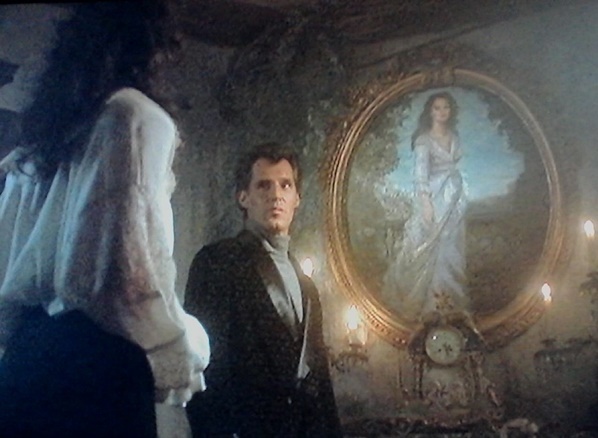 The following evening, a gentleman with a British accent shows up at Collinwood and introduces himself to Elizabeth as a distant cousin from England, a descendant of that fellow whose full-length portrait hangs above the staircase and whom he looks just like. He even has the same opal ring and silver wolfs-head cane. In an interview on one of the Dark Shadows DVDs, Dan Curtis spoke of this revival series and said that they went through their story too fast, that he should’ve saved Barnabas’s appearance for a later episode. I think that, to a certain extent, that would have been better. Maybe not a later episode, since for most people Dark Shadows does mean Barnabas Collins and viewers would get impatient if they had to wait too long for him to show up, but I do think that his arrival should have been put back just a little. Willie opens the coffin 15 minutes into the show and Barnabas knocks on the front door of Collinwood about 10 minutes later. Once he’s there, he takes center stage. We should have had more time to meet the other Collinses, and Vicky, first. From Vicky’s introductory voiceover, it looks as if Dan Curtis meant to use the mystery of her past and parentage, and perhaps resolve it now that he had the chance. But once she arrives at Collinwood, it’s never mentioned. A few episodes later, she tells Barnabas that she was brought up in an orphanage and knows nothing about her own family–but that’s it. More information concerning her unknown past, and a few hints that Elizabeth and Roger know something about it, would have set them all up nicely. 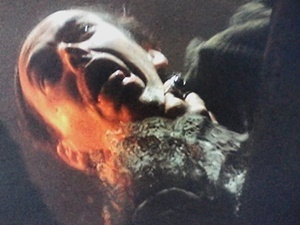 Ten or 15 minutes would do it, and then Barnabas could make his entrance at the midpoint of the episode. Well, here he is, chatting with the Collinses about how he’s “been looking forward to this moment for so long.” He tells them that he’s come over from London to Boston on business and couldn’t resist calling on his American relatives since he was so close. He’s a bit curt when Roger, who’s just returned from a trip to London himself, asks him about it, and slips up when he says that Collinwood is “just as I remembered,” but quickly explains by claiming that he’s heard so much about the house that he feels as if he’s been there before. He also tells them a lovely story about the house’s history, how it originally stood in the vicinity of Lyme Regis in Dorset but was taken down stone by stone, shipped to Boston and brought up the coast by ox-cart. This Collinwood is much older than the Gothic Revival building of the original series. The front hall looks like the nave of a cathedral. But young David doesn’t like it. The old house is where he likes to play, and it’s also the home of his friend, Sarah. He shows them a miniature portrait of a little girl that happens to be on a nearby table in the drawing-room, and says that this is Sarah. The family thinks he’s got an imaginary playmate, but Barnabas is interested in David’s story. This is also the first time Barnabas sees Vicky. He takes an immediate interest in her as well, for reasons that won’t be explained just yet. Daphne wasn’t killed, but she lost a lot of blood and is in the hospital. The doctor is puzzled by the bite-marks on her throat, which look like an animal’s teeth but left traces of human saliva. The Collinsport Sheriff is concerned that there’s no sign of blood at the place where Daphne was attacked. They consult a friend, a professor with knowledge of the occult, who says that there are demented individuals who believe they are vampires and actually drink human blood. These secondary characters are brought in without a clear introduction of who they are, which leaves viewers like me who have seen the old show to make assumptions, rightly or wrongly, based on who we think they’re supposed to be. I see a police chief, a gruff-voiced professor, and a doctor, I think George Patterson, Timothy Eliot Stokes, and Dave Woodard. The first one’s spot on: the Collinsport Sheriff is still George Patterson. Everyone addresses the professor as “Michael,” but that didn’t trouble me since Stokes’s first name has been changed before. When we do hear his last name, however, it’s Woodard. The doctor’s name is Hiram Fisher. Another character identification by assumption. 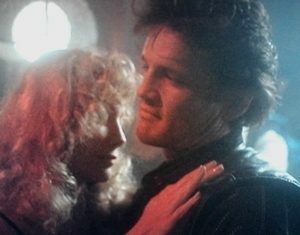 Carolyn goes out dancing at a local dive–not the Blue Whale–when a guy in a leather jacket hits on her. He’s in the credits as Local Tough, but I immediately call him Buzz. After Carolyn takes a swig from Buzz’s beer bottle without asking, Buzz ditches his girlfriend Gloria to make his move. Carolyn rebuffs him. Gloria leaves in a huff (amusingly telling her boyfriend to “Buzz off!”), and runs into Barnabas in the parking lot. He’s just getting his teeth into her neck when Buzz hears her scream and comes to the rescue. Barnabas attacks Buzz too and gets a two-for-one. The young people who were dancing at the dive, including Carolyn, come out and crowd around to look on in horror as Sheriff Patterson and his deputies examine the crime scene. The police observe that these two were attacked in just the same way as Daphne Collins, but they’re both dead. 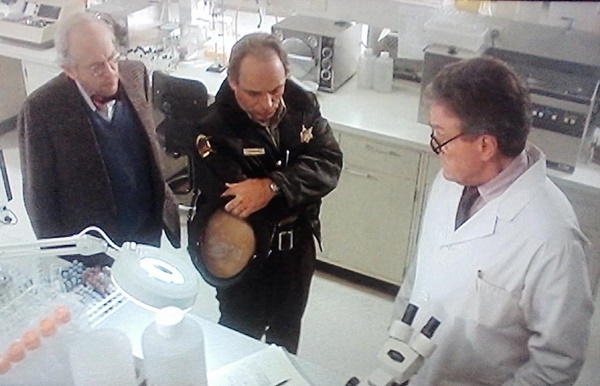 Willie Loomis comes under suspicion, since no one’s seen him for several days. Patterson questions him when he does show up–neither the Sheriff nor anyone else makes note of the big bandage that Willie has on his neck, just like Daphne’s–but Barnabas vouches for Willie and says that Willie is working for him now. When Vicky and David visit the old house the next day, Willie is in charge of a crew of workmen busy renovating the place; he tells them that Barnabas has gone to Portland for the day, and gets very upset when David ventures down the stairs to the cellar. What we see, but David doesn’t get far enough to, is that Barnabas’s coffin has been moved from the crypt. David told Vicky that his friend Sarah said that Barnabas is evil. Sarah may also have told him that he’d find something in the old house cellar, but this is the only time he ever tries to go down there and explore. When he first heard about Barnabas moving into the old house, the bratty kid said he would make Barnabas sorry, but nothing ever comes of that threat either. I suppose it’s something the writers meant to get back to later. Dr. Hoffman begins her treatment by giving Daphne some kind of injections. Daphne is soon feeling much better, even though she has no memory of the attack. Elizabeth invites Julia to stay at Collinwood to continue caring for Daphne during her recovery after she leaves the hospital. 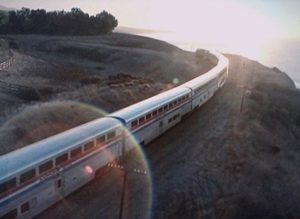 After another victim washes up on the beach below Widows Hill, Dr. Hoffman hypnotizes her patient, since Daphne is the only person who survived her assault and might be able to identify her attacker. Under hypnosis, Daphne describes his “red eyes! His teeth!” She says that she recognizes the man, but doesn’t know where she’s seen him before. Sheriff Patterson puts a deputy in the house to keep watch over her, and Professor Woodard starts to think that they’ve got a real vampire on their hands and not just a blood-drinking lunatic. Dr. Hoffman’s thoughts seem to be tending that way too, and she soon forms an idea of who the vampire is. 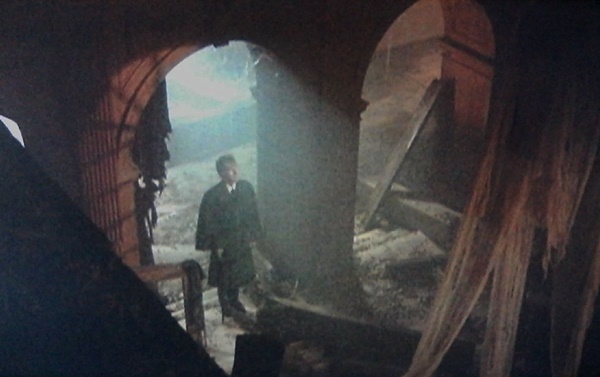 When Barnabas calls at Collinwood one evening, Daphne senses his presence and comes out of her bedroom, only to collapse on the gallery above the stairs. Dr. Hoffman takes note of how Daphne stares at Barnabas, and how Barnabas looks at Daphne before he makes his excuses and exits. Barnabas has another young woman on his mind. While all this is going on, he’s been courting Vicky. When she next visits the old house, he shows her a room that was boarded up and preserved just as it was 200 years ago. Josette’s room. 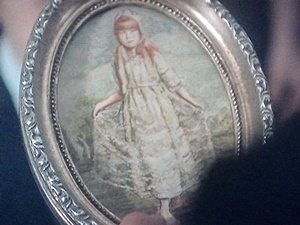 The portrait over the mantelpiece looks exactly like Vicky. In a nice little touch, while he’s talking, we hear the faint tinkle of the familiar melody from Josette’s music-box even before it’s seen. Barnabas shows the music-box to Vicky on a later dinner date at the old house, and even suggests that it would be “exquisitely romantic” if he and she were the reincarnation of that earlier Barnabas and Josette. Vicky, who already feels somehow connected to Josette, eats this up. She’s very taken with Barnabas and his charming, old-fashioned ways. That accent and the way he looks in a turtleneck sweater probably help things along too. She’d feel quite differently about him if she knew that Willie’s face got all bruised up not because he “fell,” but because her new vampire boyfriend beat the hell out of him for trying to warn her. After dinner, he escorts Vicky back to Collinwood. After all, there’s still a murderous maniac running loose and he wants her to be safe. He gets a kiss at the front door–a quick, shy peck that almost misses his mouth. No necking, but that’s obviously what’s on his mind; after Vicky goes in, Barnabas hangs around outside below her bedroom window to watch her and makes bitey motions with his mouth. I like Ben Cross as Barnabas. I’ve accepted him in the role and think that, for the most part, he’s done a good job being charming and attractive when he needs to be, and becoming frighteningly bestial when he’s attacking someone. But I wish he wouldn’t do that thing with his mouth when he’s being vampiric. It looks silly–like he’s trying to blow a kiss but he’s afraid his fangs will fall out. His perving on Vicky is interrupted by a child’s voice calling out his name and telling him he must stop. 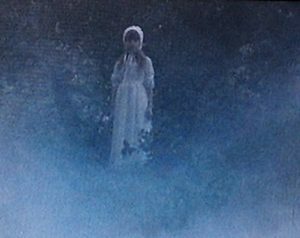 Barnabas turns to see a little ghost-girl dressed in colonial-era clothes, standing in the mists behind him. Actually, Sarah’s been watching him since he and Vicky walked over from the old house. I’m surprised that nobody at Collinwood heard him. The episode ends with a caption, “To Be Continued…” and I’m ready to see more of how this revised, revisited version of the story unfolds.